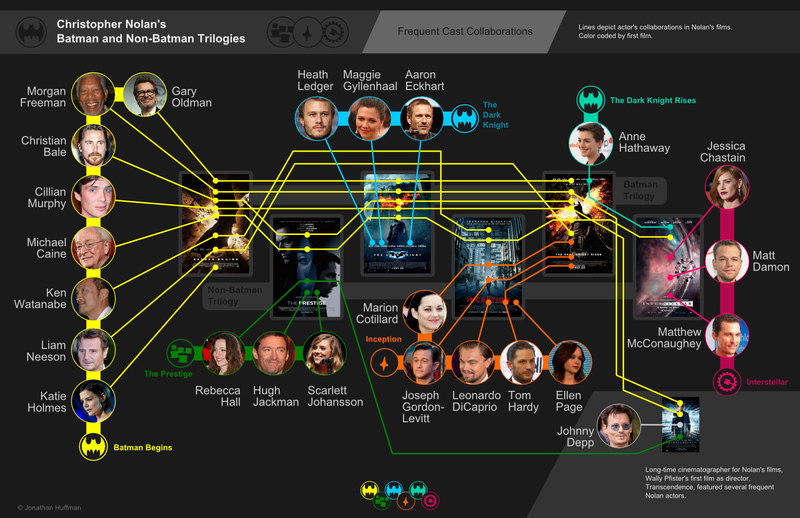 Considering that the next incarnation of Batman on film is looking likely to be pretty bad (and no offense to Ben Affleck, I have come around to thinking he could pull off the role), I thought it would be fun to remember the amazing Christopher Nolan trilogy of Batman films, as well as the non-Batman trilogy that accompanied them, with an info-graphic detailing cast collaborations. In-between Batman films, Nolan filmed another set of films that were just as beautiful, mysterious, and interesting. Many of the same cast members played parts in many of the six films. Here is a graphic that depicts how the cast from all six films are interconnected. Maybe I'll be wrong about Superman vs Batman. I hope that I am! I'm still going to see it, I just have that same Indiana Jones and the Kingdom of the Crystal Skull kind of sinking feeling about the movie.